The next day, still all I can see are the monkey’s green eyes. 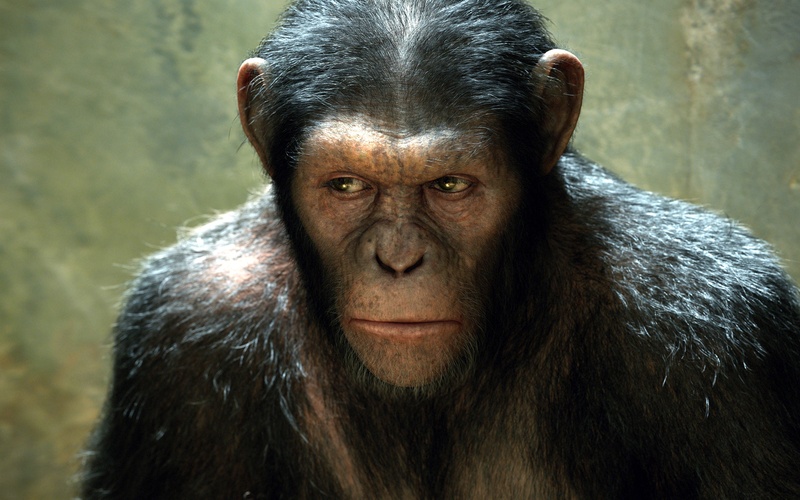 “He’s an ape, not a monkey,” one of the lab scientists reminds Jacobs, the ruthlessly pragmatic CEO of GEN-SYS. Right. Apes. As in Planet of the Apes. As in “the rise of.” How it all began. It got me thinking about the lore. About how if this movie hadn’t been a part of a larger context, what would it have been? Likely a horror flick – you’ve seen them. Psycho monkeys are administered some form of drug. They’re infected with rage, some sort of neurotoxicity; they bash everything in sight with their arms flailing like meaty windsocks. They bare their fangs. In another movie, in different hands, this story would likely fail. You wouldn’t care about the savage monkeys – they’d be the bad guy. You wouldn’t care about the hapless scientists either – likely they’d be meddling with “powers they can’t comprehend” because, in a cookie-cutter movie, that’s what numbskull scientists do. But not here. Here you are transfixed – that ape’s eyes, Caesar’s eyes, they’re able to convey more depth and emotion than his human counterparts. 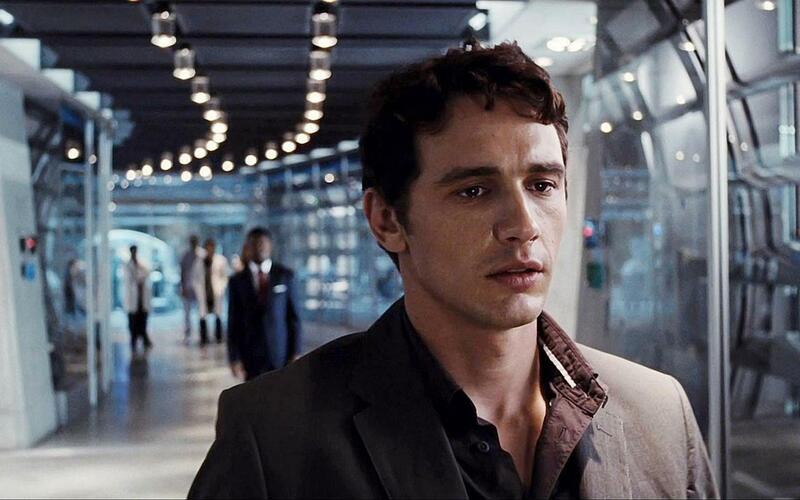 James Franco turns in just the right performance as Dr. Will Rodman. It seems the actor and director were able to grasp that Franco is not the lead in the film, and even managed to dial down some of that star magnitude. In his plain suits and white lab coat, Franco’s eyes are almost dull compared the Caesar the ape’s. He is a bit hapless, yes, but he has to be. Rodman is the scientist who tips over the jar and spills the plot into motion. And he perpetuates this motion by a series of bad choices. First is his overconfidence in the gene therapy drug ALZ-112, then his decision to illegally experiment on his father with it. And for a brilliant scientist, he seems somewhat dim-witted when it comes to common sense – the fact that Caesar is going to grow up, to hit puberty, to need to flex his ape muscles, these things have to be pointed out to him by Caroline Aranha (played by Frieda Pinto, who is, through no fault of her own, often distracting with her attractiveness). But Franco, aside from neurochemistry, is not supposed to be all that bright. It’s not even his story anyway – it’s Caesar’s. And that’s what the filmmakers have grasped, and that’s why it works. The script, from Pierre Boulle, Rick Jaffa, and Amanda Silver meticulously constructs the world surrounding Caesar the way a screen story should. There are set-ups and pay-offs galore, but none so glaring that they roll any eyes. The craft at work is subtle – in one scene, Caesar uses the elm trees above a suburban street to move himself along, and in a later scene when those leaves start to rain to the ground, we know it’s because Caesar’s primate army is now marching. In another, Caesar sees a dog on a leash and makes the connection to his own leash. Later, when Franco returns to the animal-jail to retrieve him, Caesar looks at the leash Franco holds and turns away. Finally, yes, the CGI is stunning. The days when the seeds of computer animation first moaned in the ground to this full maturation of the technical art has been an undulating journey with highs and lows. Here, though, those who’s purview it is to create an entire character and group of characters using the effects are at the top of their game. 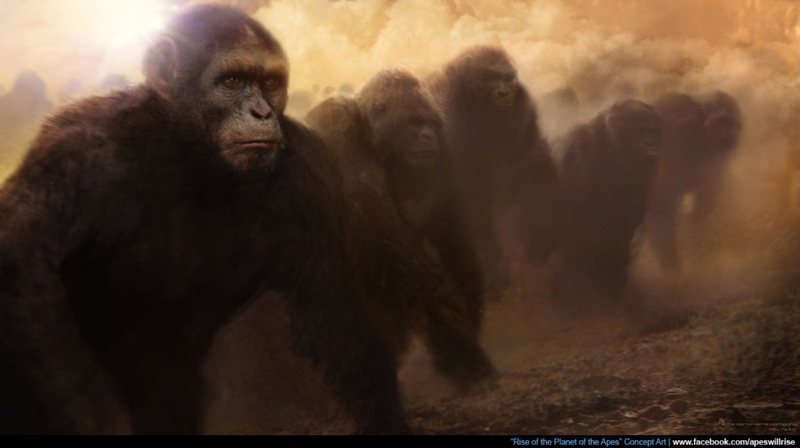 It isn’t dinosaurs slicked with rain, head transplantation, or body dysmorphia, it’s a bare-bones group of simians, meant to look and act like the real deal – only smarter. Without good story-telling, though, the best CGI is a padded bra at best. Here, when an imprisoned and suffering Caesar signs through the cages with a captive orangutan, is the transcendent moment which endorses the rest of the film. We are watching a story unfold about prisoners, about underdogs, about an uprising. Maybe that’s because the director, Rupert Wyatt, both penned and helmed the critically acclaimed 2008 film The Escapist, about, you guessed it, a prison break. In any case, we feel for Caesar – each of his emotions are expertly conveyed in his sculptured expressions: the down-turned mouth, the half-lidded eyes, the strength of his gaze. Andy Serkis, who provided the motion capture for Golem in Lord of the Rings, brings Caesar’s gestures and body language to life. Pervading all of this is a story very aware of itself, written by a trio of intelligent writers, and realized under Wyatt’s confident direction. Devoid of gimmicks or even the slightest bit of hamminess, we are delivered a straight story, with only judicious use of the iconography we want from a legendary tale. It’s all just enough to create an epic – or, to lend to an epic already standing, and to do it justice. Viewed at The Palace Theatre in Lake Placid, Adirondacks, New York. This entry was posted in movies and tagged adirondacks, lake placid, movie review, palace theater, palace theatre, review, rise planet apes. Bookmark the permalink.